Vetiver Essential Oil has a rich, grounding, earthy aroma and is often used in perfumery as a fixative. 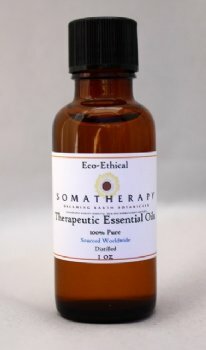 100% Pure Vetiver Essential Oil is emotionally grounding, calming, and stabilizing. Vetiver is deeply relaxing, soothing oil for mind and body. Vetiver essential oil is more pleasant when diluted and is a useful oil for blending and perfumery. Vetiver oil may also be useful to help with acne, anxiety and depression. Due to its anti-inflammatory properties, Vetiver oil may be helpful for joint pain and inflammation. A study conducted in 2001 by Dr. Terry Friedman MD compared the effects of lavender, vetiver, and cedarwood essential oils in improving focus and learning in children with ADD and ADHD. Vetiver essential oil was found to be the most effective in observations and brain wave scans - showing improvements in 100% of the children studied. In the study, the children, ranging in age from six to fourteen years of age, were asked to inhale the aromas of Vetiver, Cedarwood or Lavender three times a day over a 30-day period. From the study: "Treatment outcome results reveal that the essential oil of Vetiver improves the brain activity and reduces the symptoms in ADHD diagnosed subjects. Similar results were found with the essential oil Cedarwood, although not statistically significant. This lack of significance could be the result of the relatively small number of subjects in this study. The Lavender group showed no apparent improvement after the treatment program." While many factors are important in working with ADD/ADHD, this study seems to indicate that essential oils may be an effective ally in helping to increase concentration and focus.